Clean Waterlines With Quality Purification Technology for Dentistry | Benjamin S. Fiss, D.D.S. The bacteria that live in this world number an incomprehensible sum. As health care professionals, we continually fight to maintain the cleanest environment for infection control and patient safety. Dr. Fiss has been using water purification in his practice since early 2000 and has adopted a proactive infection control policy using advanced technology to ensure the safety and purity of the water quality in all our dental units. The cleanliness of the waterline in dental units is extremely important. Dental units contain plastic tubes that transmit water and compressed air into the handpieces that are used as a part of the dental treatment. Careful investigative study of these plastic tubes has revealed that their design promotes an ideal environment for bacteria accumulation and water stagnation. Some samples have reportedly had a concentration of bacteria numbering more than 2,000 times the standard of 500 CFU/mL (colony forming units per milliliter) established by the Environmental Protection Agency (EPA)! Harmful levels of bacteria place the patient at risk. Dental waterline maintenance requires attentive care and advanced technology to ensure that the water is safe for patients. The DentaPure® microbiological dental unit waterline purification cartridge, by Crosstex®, makes it much easier for dentists to maintain safe and regulated dental unit water. Once installed, this device can meet all known standards and recommendations for microbiological water for a full 365 days, even without any monitoring. This device uses the same technology developed for NASA to ensure that water consumed in space is safe from harmful levels of bacteria. 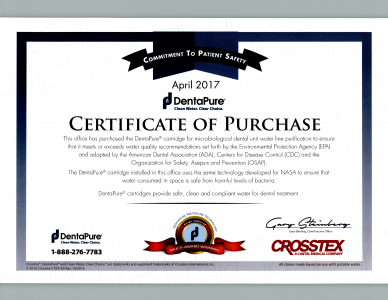 The DentaPure® cartridge has allowed Dr. Fiss to meet and even exceed water quality recommendations set forth by the EPA. The installation and use of DentaPure® is just one evidence of the commitment to patient safety that Dr. Fiss has made. Dr. Fiss and his staff not only excel in providing the best patient care but also in ensuring that the office is as clean and sterilized as possible. As regulations regarding infectious diseases have grown, agencies such as EPA, the CDC, and OSHA are requiring higher standards of compliance. Dr. Fiss has gone the extra mile to incorporate new materials and techniques as soon as they become available, even before regulations are put into place. Sparing no expense and labor, our office has considerable equipment to maintain optimum cleanliness and safety levels for all patients and staff. Our patients know that they are the beneficiaries of clean, reliable, and safe dental care. Dr. Fiss is committed to providing the best and safest experience for all his dental patients. To request your next dental visit with Dr. Fiss, please call (312) 951-5230 or contact us online today.